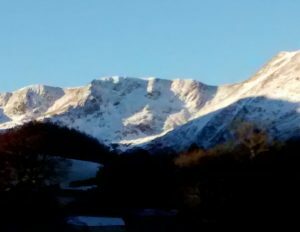 View from hut, morning of ABMSAC AGM Feb 2016. 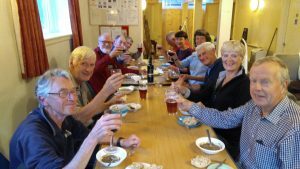 The Hut is run jointly by the ABMSAC (Association of British Members of the Swiss Alpine Club) and the Alpine Club. It offers bunkhouse style accommodation whilst retaining the ambience of a traditional mountain hut. During 2016 and 2017 we completed 2 major improvement programmes to bring the insulation, heating, dormitories, windows, lighting and kitchen up to a higher standard and to improve the general comfort throughout. We hope more updates will follow with improvements to wash rooms and dormitories. 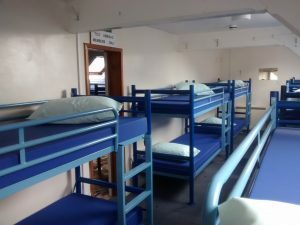 There is accommodation for 28 in bunk beds. The Men’s Room has 14 beds, the Ladies’ Room has 6 beds and there is a Members’ Room with 8 beds. Male/female segregation is optional and we leave it to users to decide for themselves based on their relative numbers and preferences. The Members’ Room is reserved for Alpine Club and ABMSAC members. Note the dark box to right of the lock is the keysafe. Instructions for use are given after bookings and final payments are made. Inside the front door, the vestibule has boot racks and gives access to the large drying room equipped with a fan heater, extractor fan and de-humidifier. 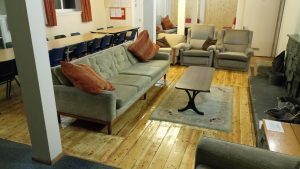 An inside door leads through to the large communal area with a modern smokeless fuel stove, a comfortable seating area and dining tables. Books, games and maps are available. Notice boards give useful local information and details about the Hut services. 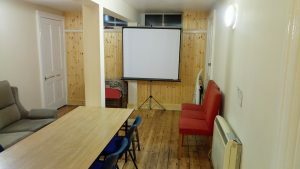 There is now a projector screen at the rear of the communal area and seating can be arranged around to avoid the pillar. Projector not provided. 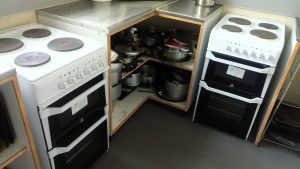 This is equipped with two cookers, two double hobs, a large fridge and a small one (but note, no freezer), two microwaves and two sinks with drainers. 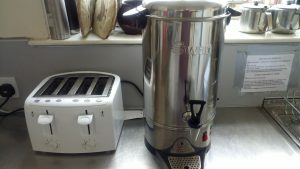 Constant hot water is provided and there are assorted kettles and toasters. 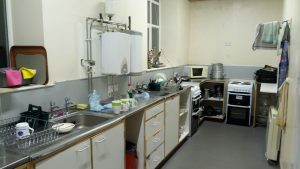 All cooking utensils, crockery and cutlery, and some tea towels are provided. There are shelves for food boxes. Two separate doors lead from the communal area to the washrooms and to each of two staircases up to the dormitories. These are also fire exits. 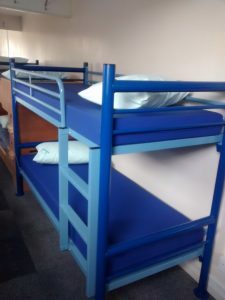 The bunks are new and the upper ones are equipped with safety rails and ladders. Small storage caddies are provided for your torch and specs. 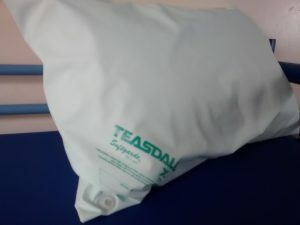 The bunks have new hospital-style wipe-clean mattresses and pillows. You need to bring your own towels and bedding: normally a sleeping bag and pillow case. There are a few blankets available. Hygienic pillows, bring your own pillow case please. Newly fitted do uble-glazed roof windows are in each dorm. 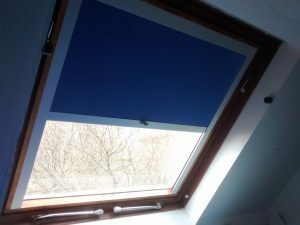 They can be opened for ventilation, and are newly fitted with blinds. The men’s washroom has four hand basins, two showers and two loos. The ladies’ washroom has two hand basins, one shower and two loos. Both washrooms have night storage heaters, fan heaters, constant hot water, and fire exits. 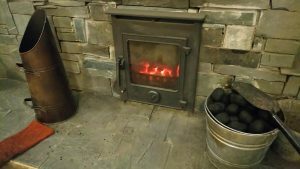 The Starkey Hut is heated throughout by night storage heaters, and additionally with a new smokeless solid fuel stove in the lounge. When well stacked with fuel late evening the fire will last until morning for winter comfort. There is a modern fire alarm system which is serviced twice yearly. There are appropriate fire extinguishers and blankets, checked annually and replaced as necessary. Electricity, gas, smokeless fuel, hot water, general consumables such as toilet rolls, and cleaning equipment are included in the hut fees. 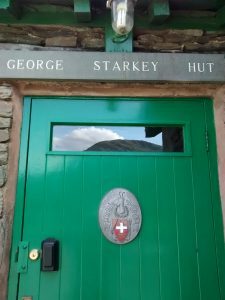 The George Starkey Hut has a private car park behind the Hut with space for about 12 cars.This is a significant benefit as parking is at a premium throughout the valley. Camping is not allowed in the car park. Cars should not be parked at the front of the hut as that’s not our land, and the Old School House B&B needs parking for their guests. In the car park is a large wheelie bin (emptied each Monday) for non-recyclable waste. There is a coal bunker containing smokeless fuel. 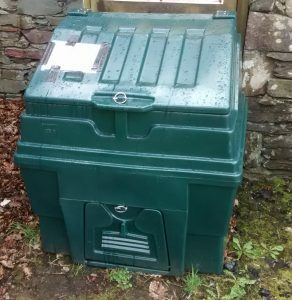 Recyclable waste must be taken away with you: there are recycling facilities in Glenridding main car park. No parking charges for short visit!